Samsung's latest Windows Mobile 6.5 phone also runs the TouchWiz 2.0 user interface, meaning it skips most of Microsoft's experience and substitutes Samsung's. If you're looking for a smartphone packed with software and features galore, the Omnia II just might be for you. There are a few drawbacks to consider, however, and Phone Scoop weighs in on this weighty device. Flash 9 on Omnia II? I want to view videos on my Omnia II, such as on Myspace, and lsiten to music on Myspace sites, but get a grey box that says Flash 9 in red...how do I get flash 9 on the Omnia II? Or is that not possible? I need a Omnia II for Dummies guide!! Thanks for the detailed review. 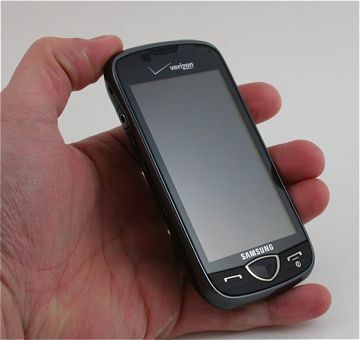 If you are a VZW customer using an older WinMo 6.1 phone, is this a phone that you would buy now or wait for the nextgen 2010 phones to come out? It doesn't look to be that responsive, or it seems slow to go through the programs, is that a correct statement? I figured that I have waited a year and a half for "the phone" from VZW, I thought this would be it but now I am very hesitant and wondering if I should wait a few months or look at a different brand? I'm a power user of the older Omnia. I have a better form of windows mobile 6.5 than this version. Other than the screen, is there really an advantage in upgrading? I know that the specs are better but I'm worried that there won't be the ROM's available for this version to make it worth it.